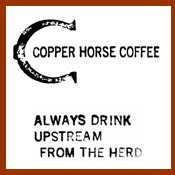 Most coffee roasters older than disco do not produce coffee worth coffee drinking. Whether one attributes it to a fear of change or the stubborn fortitude of old habits, most coffee purveyors that predate Alfred Peet still usually purvey subpar coffee. Thus in light of the disappointing odds for old coffee roasting operations, it's pretty amazing that Ferris Coffee and Nut, having been around for nearly a century, delivers some pretty amazing coffee. Located in the glorious city of Grand Rapids, Ferris has a rich history of providing high-quality goods to their customers. Today they boast two beautiful cafes in Michigan as well as a large product line including various nuts and chocolates. 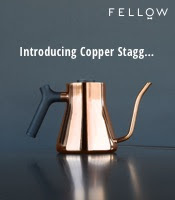 Not often traversing Michigan, I was most thrilled when I recently had the opportunity to take a few of their coffees into my home, each of which I sampled via pourover, french press and siphon. The Costa Rica Sumava went first, with the pourover singing of honey, molasses, raisin, sugar cookie, sweet corn and a touch of cream in a medium body. The french press proved a little thicker, with notes of sugar cookie, raisins, molasses, pretzel and cream. The last and nuttiest infusion was the siphon, making for a cup thick with cashews, honey, molasses, raisins, pretzel and milk. All in all, a good coffee that proved thick, creamy and nutty. Guatemala San Sebastian stepped up to bat next. The pourover overflowed with nougat, apple, walnut, strawberry, buttered fresh bread and some mustard greens in a medium body. The french press proved similarly smooth and sweet, full of nougat, walnuts, cascara, mustard greens, cream and birch beer. The siphon made for a slightly brighter brew, with some plum and more birch beer coming through, confirming a full-bodied, sweet coffee that would please most palates. Finishing out the series was Ethiopia Misty Valley. The pourover trumpeted notes of raspberry, rich chocolate, juicy apple with skin, caramel, milk and black tea, making for a bright and fruity infusion. The french press also exploded with flavors of blueberry, chocolate, cider, caramel and rose petals. The siphon, the most subdued of the three, still belted out a bright concoction of raspberry, nougat, cider, cream and vanilla wafer. Of the three coffees, this Misty Valley was as bright as the sun and hands down my favorite of the three. 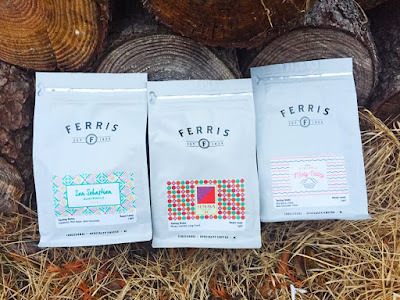 Having greatly enjoyed these three coffees, I strongly recommend trying out some of Ferris' single origins and blends, erring towards the lighter of their roasts (not a huge fan of the darker coffee). Thus, whether you're in Grand Rapids or shopping online, definitely try out some coffee from Ferris. note: coffee was provided free of charge and the above view is objective feedback.